I have a new bounce in my strides. A new spring in my legs. A new zing on my feet. No, I did not discover the fountain of youth. It’s just my new running shoes. It’s Nike Zoom Structure Triax +15. (I don’t know why the long name.) It’s all about the shoes, right? I replaced my old beat-up Nike shoes as I have run it to the ground. Old and worn out running shoes can lose their stability, cushioning support, and shock absorbing ability, leading to increase stress to feet, legs and joints that may cause injury. The experts in running recommend that you replace your shoes after 300 to 400 miles of running. I believe my old sneakers have more mileage than that. In my conservative estimation, I run at least 5 miles a week, when I am not seriously training, and up to 10 miles a week, maybe more, when I was preparing for the half marathon. So I could have run 300 miles in a year, easy. Thus my old running shoes was way due for a replacement since it was almost 3 years old, and has more mileage than what the gurus of running recommended. Maybe I held on to my old running shoes for so long since I felt quite nostalgic about it. After all, it was in that shoes that I ran my first half marathon. And it even let me finish my second half marathon too. But it was time for it to retire. It was not the first shoes though that I ran aground. When I was in second grade of elementary school, I had sneakers that I destroyed, literally, in less than a month. With all my running, jumping, climbing, and playing “sipa,” it broke open. The sole and the upper part separated as if my shoes was “smiling”, while my socks stick out of it like a tongue. My father got frustrated with me that he told me I needed shoes made out of iron, like a horseshoe. My new Nike Zoom Structure Triax +15 (sorry, I can’t get over its long name) is not also the first sneakers that I got excited about. When I was about to enter Kindergarten, my parents bought me a new pair of shoes for school. It had rubber soles and rubber toe cap. The upper was colorful canvas with bright cartoon images printed on it. I love it so much I placed it near my pillow on my bed when I sleep at night. Maybe I should also put my new Nike shoes near my pillow when I sleep. On second thought, my wife would probably slap me with those shoes when I start snoring, so never mind. A good pair of rubber shoes can be pricey, especially brand name shoes. It can be a status symbol too. My first sneakers with a famous brand was what George Estregan wore in his action movies, Adidas Hurricane. I think I was in high school then. Before that, all my sneakers were “no name” shoes, or at least not popular brand, like Nike, Converse, Puma and the like. But they work just the same. No-name and locally made shoes does not necessarily mean poor quality, for I would say Marikina-made shoes are good shoes. For a long time I also dreamed of having hi-top or hi-cut basketball sneakers when I was much younger. I envy some of my friends that have them. But since it was so expensive, I did not even asked my parents to buy me one, for I know I can live without one, and besides my parents provided us with what we need. The only hi-top shoes I had during my school years was my “Ang Tibay” combat shoes which I used for Citizen Military Training (CMT) and Reserve Officer’s Training Corps (ROTC). And yes, I sometimes played basketball even with those shoes on. After running a few miles in my new Nike Zoom shoes, I felt great. My legs did not feel tired at all. My feet did not ache. Even my bunion did not ache. I wonder if these are the dream shoes that will run and finish my first ever full marathon. After all, it’s all in the shoes, right? Well, I wish it is that easy. For I would say it is more of determination rather than the shoes. More heart, than sole. Now, I just need to buy that “determination” from the store. I hope it is on bargain. akala ko naman kung ano yung dahilan ng new bounce in your steps 😆 i hope these shoes will be the key to your marathon success! its all in the state of mind insan… by the way what a nice shoes you got… i forgot already what jaworski wore back then… kaypee ba un??? Jaworski wore Converse and has a line of shoes with it in the early 80’s. I know Patrimonio and Fernandez endorsed Kaypee, and I can even remember their commercial with it, in the early 90’s. That’s amazing to think that their sandals did not wore out for 40 years. I’m looking for shoes with wings, like of the Greek god Hermes…..then I could fly like the wind! 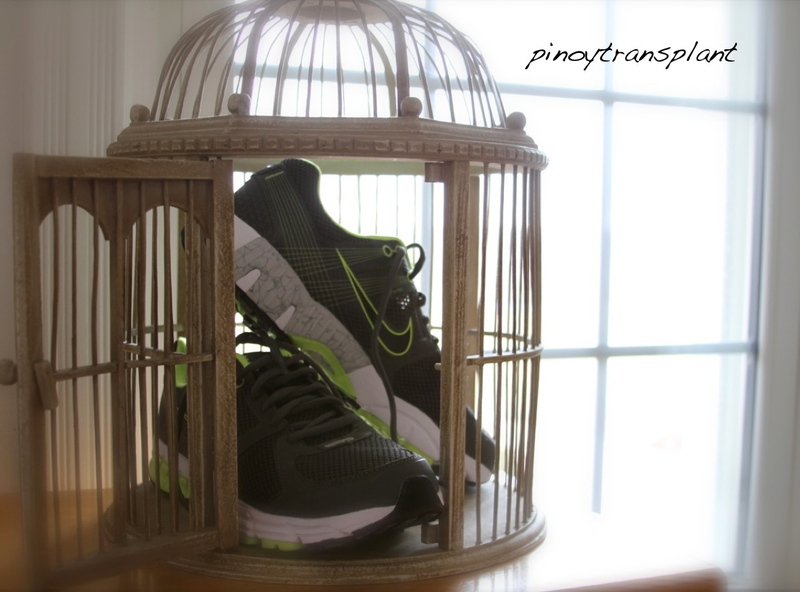 nice cage too…did it come with the shoes from nike store and ‘determination’ too?